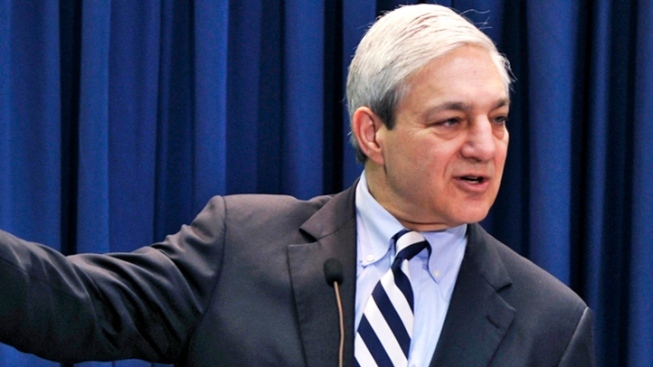 Former Penn State President Graham Spanier topped the best paid college president's list for last year. The Chronicle of Higher Education's annual ranking of public college presidents' earnings said Spanier's $2.9 million pay, which included $1.2 million in severance and $1.2 million in deferred compensation, put him well ahead of his peers when he left Penn State in November 2011. While the median compensation for public college presidents was $441,392, a 4.7 percent increase over 2010-11, Spanier was one of four chief executives to surpass the $1 million threshold in 2011-12, one more than the previous year. The others were Auburn University President Jay Gogue, who received $2.5 million; E. Gordon Gee of Ohio State University, who earned $1.9 million; and now-retired George Mason University's Alan Merten, whose total pay plus benefits and deferred compensation totaled $1.87 million. Ball State University's Jo Ann Gora collected $500,000 in deferred pay on top of $431,000 in base pay, launching her into the top five earners, with a total of $985,000. She was one of two women in the top 10, ranking just above Mary Sue Coleman of the University of Michigan, who earned $919,000. Coleman was the lone woman among last year's top 10. Gee, who topped the 2010-11 earnings list and became the first public college president in the million-dollar club in 2007-08, had the highest base salary last year: $830,439. That was more than double the median base salary, which inched up 2 percent to $373,800.